Use the Chef Revival 600BAW-XL Extra Wide White Polyester Bib Apron to protect your staff's garments from spills and stains ensuring a clean and professional look. Tailored with a pencil pocket, this extra wide white apron provides ample space for storing a pen, pad and other small essentials. 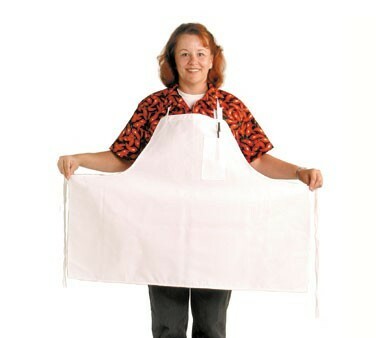 An excellent combination of size, functionality, and quality, this bib apron is made from a poly/cotton blend which ensures long lasting performance.